International Business is a well-established research field, in which regionalisation has recently gained significant prominence. Europe comprises marketplaces characterised by unique patterns of highly advanced economic integration. No other marketplace in the world has progressed to the same levels of harmonisation across sovereign countries and economies. European Business is a subject in its own right with its own research momentum. Contemporary research evidences that firms view Europe as a challenging, mostly – yet not entirely – mature market location. Yet this location, often seen from a multi-country perspective, is subject to complexities revealing strategic corporate strengths and weaknesses. Theory, concepts and models known from International Business hence often vary in their applicability and relevance in this business environment. 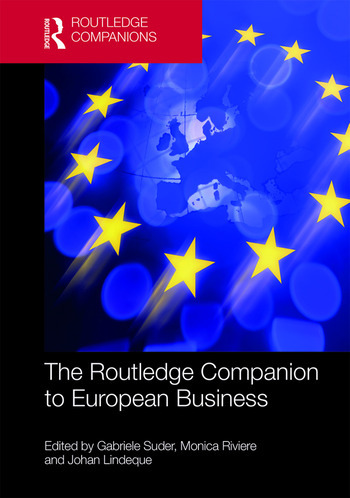 This comprehensive reference volume brings together a global team of contributors to analyse and overview the key issues, themes and phenomena that affect business in Europe. With interdisciplinary perspectives, the book covers crucial themes that any European Business research needs to acknowledge, including business cultures and identity, entrepreneurship and innovation, M&A and institutional trends, European HRM, migration, climate change issues, Brexit, and more. The selection of authors, from 17 countries worldwide, reflects the international scope of this research field and its agenda. A unique resource, this book provides an essential guide to researchers, research students and scholars of business and the social sciences, as well as the informed business community. Gabriele Suder, PhD, is Professor and Professorial Fellow at The University of Melbourne and its Melbourne Business School. She is also trade and investment expert at the EU, UNCTAD and the Australian Government, business advisor and an entrepreneur. Monica Riviere, PhD, is Assistant Professor of International Business Strategy at ISC Business School Paris. She co-manages the Master of Science – Innovation in European Business with the University College Cork, Ireland, and the University of Applied Sciences Utrecht, the Netherlands. Johan Lindeque, PhD, is Senior Research Associate at the University of Applied Sciences and Arts Northwestern Switzerland, and affiliated with the University of Amsterdam Business School.